What is Sucralose? * Sucralose is the active ingredient in Splenda® sweeteners. Splenda is not truly ?No Calorie? because it typically contains carbohydrate bulking agents. But our sucralose powder and liquid are truly Calorie-free. Powder vs. Liquid Pure sucralose is solid. Our sucralose powder is 100% sucralose and nothing else. * Powder is pure (100% concentration). * Liquid is at 25% concentration (still a high concentration and needs diluting). Ingredients: Water, sucralose (25% of total weight), citric acid, sodium citrate, with potassium sorbate and sodium benzoate as preservatives. Our Service :Your order is shipped typically within 24 hours, but no more than 48 hours after payment is received. Please contact us for any question or concern. 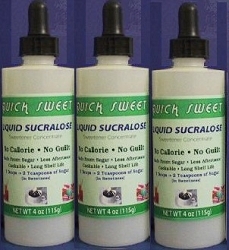 We also offer sucralose in different amount and in powder form.